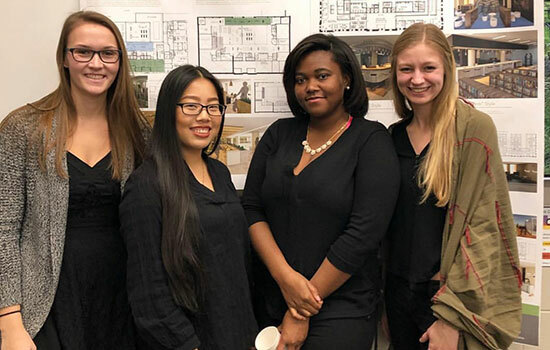 Kiasia Singletary, second from right, and her classmates showcased their Ascension project, which is a seven-story homeless shelter and community center with living, dining and community outreach/learning space they designed for their Multi-Story/Purpose Design class this fall. Singletary graduates with a bachelorâ€™s in interior design in May. Kiasia Singletary, a fourth-year student graduating with a bachelor’s in interior design, is poised to take the next step toward a career in architecture. In June, Singletary will begin an internship with LaBella Associates, an international architecture, engineering, environmental and planning firm headquartered in Rochester. After six months the firm will review her employment and potentially hire her for a full-time position. Eventually she plans to continue her education and pursue a master’s in architecture. But while she is flourishing today, she faced adversity in her path to graduation. Singletary wasn’t used to failure. She flourished in high school and earned a full scholarship to RIT through the Destler/Johnson Rochester City Scholars program, which provides free tuition and academic and social support for graduates from Rochester City School District and approved charter schools with financial need. So after struggling with classes in her first semester at RIT, she realized she needed to make adjustments and overcome her shyness. She turned her grades around, began to succeed academically and eventually became a Dean’s List student. As she took classes, she kept herself grounded by working weekends as a cashier at Wegmans and got involved with student organizations like Unity House, the Organization of African Students and the Interior Design Club, where she served as secretary. She didn’t let the initial setback derail her progress, and she will graduate on time this May. She believes her story is a lesson on the importance of perseverance.